I've had them for three months and its been nothing but a headache, at least 10 people have come out to fix random that's broken.. my internet drops all the time.. it works for a week then stops for a week. they cant ever figure out .. Send a private message to Mr F.
Find More Posts by Mr F.
Dont know why people would switch from comcast? comcast is good until their introductory offer runs out and you start paying full price. hmmm, ive never had a problem with my uverse internet. Originally Posted by Mr F.
THIS. I need to do something. My price jumped $15 a month when I ran out my contract. Same here. They have to come out every few months and fix that . How the did you guys get raped into a contract with comcast? I got below introductory prices and no contract. Once again thanls "Danny that no longer works at Comcast"
I would have agreed with you back when it was time warner, but since comcast has taken over they've really turned it into . The customer service is . It took me seven months to get them to fix a simple billing issue, and it took me canceling my service to finally get it resolved. 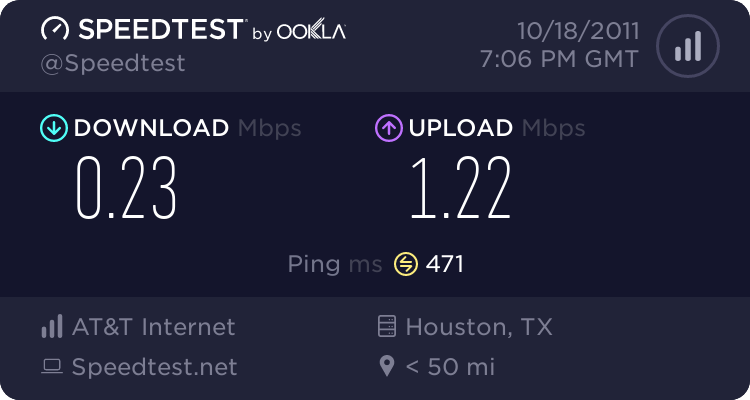 I had their service out in katy and the speeds were less than the advertized speeds, and it went out fairly frequently, at least once or twice every few days. Like I said though, still worth it for the blast service for $29.99 a month, but as soon as that's over and it shoots up to fuggin $60, not worth it. I used to be able to call and about it and they'd get me on the next special offer, but they stopped doing that. So if I'm going to pay $60 I'm going to give it to att for uverse service. I'm kind of curious to know if the OP has uverse or just dsl service, because the screenshot shows SBC internet which shows for ATT's dsl service, and when I run the speed test for my uverse service it says "UVerse"
yea. Just called and saved $50 a month on my cable bill. Apparently comcast "stopped applying my package discount." I don't think he meant contract, I think he meant the term of the special offer. I'm not even sure that comcast does contracts on residential service. Last edited by Mr F.; 10-18-2011 at 02:25 PM. They DID contracts. Or at least when I signed up I got an even lower rate than advertised if I was willing to sign up for a year contract. I always just signed up for internet service with them and used the free basic cable that came with it. I don't know if it's any different for extended cable tv service as I've never needed to purchase it. The only time I ever heard about any contracts from comcast is last year when we were exploring them as an option for our phone and internet service at our shop. Never really have problem with Uverse. My wireless does stop working every other week or so on my Uverse box so I just reboot it remotely from a PC. No big deal. Resident CHL instructor. Inquire within. I have their "everything package" Never done the al a carte thing. get a seperate wireless router from best buy. The equipment they provide is garbage. Did this at kib's house, and the wireless is WORLDS better. Before, if one machine in the house was downloading, nobody could even browse the web. Now, everything works like expected. Yea, I have less than 1TB, and have actually gotten nastygrams from Comcast explicitly listing things I've downloaded. EDIT: That, and I have photographic memory so only the REALLY good movies have any kind of reply value for me.